Welcome to the best of 2010 where we relive all our meals this past year and previous years to give you what we feel is the best of the best: the maple syrup on your French toast, the whipped cream on your pancake… you know what I mean. Keep in mind some places were reviewed a few months ago and if they have changed since, don’t hate me. I am not all-knowing and restaurants change like the seasons. This year I changed up my categories and dropped some old ones. I want to focus more on the food and creativity. The 2008 and 2009 reviews can be viewed as well by clicking on the links. Just when I though last year’s selection process was hard, this year’s takes place. Of the places we have been to in 2010, here are some that stuck out: Café Campagne; Chien Fumant, Brigade Volante; Birks Café; Montee de Lait, Au Ptit cochon de Sante and Chez Levesque. There are some serious heavy hitters here and each excellent in their own respective fields. Even though they are all winners on my plate, similar to the highlander movies… there can only be one, and that distinction goes to Au Ptit Cochon de Santé. Having snuck in near the end of the year, this place has flavours unlike anything I have ever had before. The portions sizes are genenrous, the taste is amazing, the menu covers most needs, and they even do a nice job on presentation. This part I kind of avoided last year but I keep getting asked what my favourite place is and it’s a hard question to answer considering that each spot has its own strengths but for the sake of making everyone happy here are my favourites: Mckiernan, L’avenue, Brigade Volante, Griffintown Café, Chez Levesque and Cartet and Madre. So, after lots of soul searching and going back to some spots because they are so good, I have to go with L’avenue. Simply put, it offers a brunch option all week long, the prices are very affordable and the food is excellent everytime. If you need to pick somewhere for a great dining experience, pick L’avenue and you will not be disappointed because frankly it doesn’t screw up. I’ve been here almost a dozen times and each time when I get my bill and reflect on the meal I had, I feel like I paid too little. Au Ptit cochon de Sante This section is for some places to get mentioned that have an awesome dish that may get missed from the reviews: The Brioche French toast ($11.25) at is a WOW. This dish looks amazing and tastes even better, so come treat your taste buds and try it out. 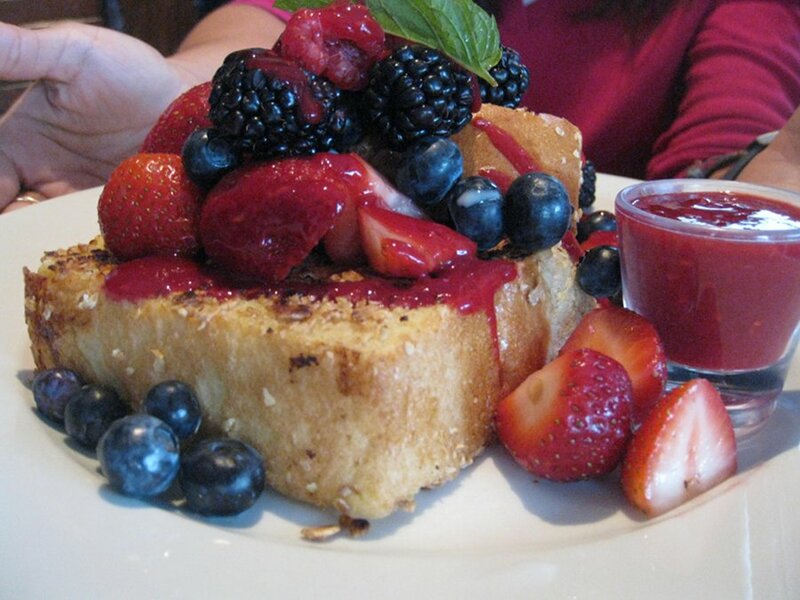 The waffles with fruit at Café Campagne($11.95) serve for a great dish. Finally, a place that not only offers waffles but does them right with a varied option of fruits. This is a winning recipe for anyone. 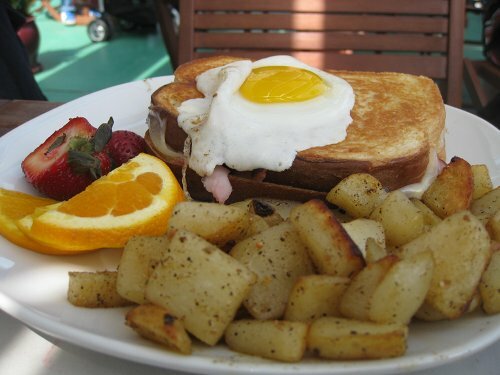 The French toast at Montee de Lait may not be on their menu for a while but if it ever does, you have to try it. 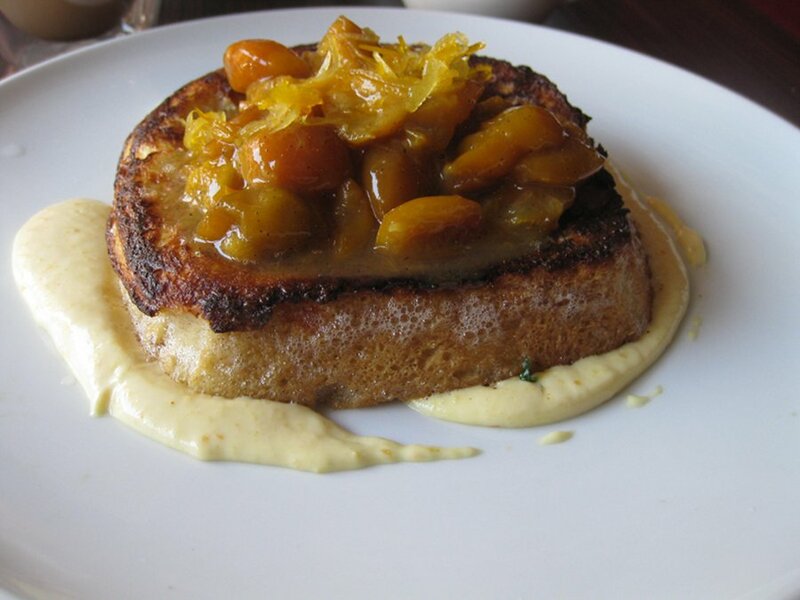 This dish came as a thick slice of French toast, topped with mirabels and loaded with natural sweetness. Chien Fumant’s waffles with pulled pork dish ($14) may sound odd but it tastes all good. 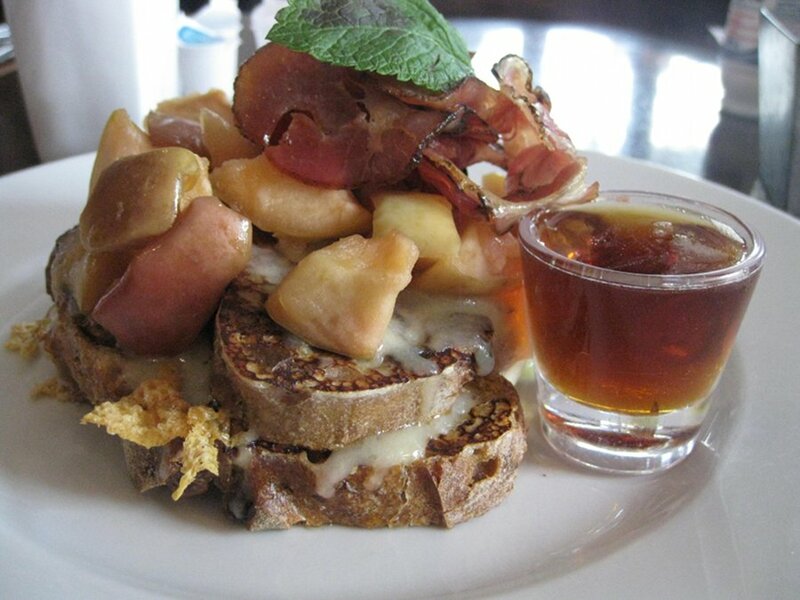 This dish is filling ,tasty and one of a kind and luckily, it is part of their regular brunch menu. Lastly the Ricotta Pancakes at Mckiernan is for those who have tried it and they know what I am talking about;so filling, so tasty and almost light while with a natural sweetness from the rubarb makes this dish is heaven on a plate. 5) Mesquite serves up an interesting fusion of BBQ meets brunch. You can get brisket in a dish as well as one of the most unique dishes I have ever seen is a peanut butter and banana sandwich French toast sandwich. 4) Brigade Volante with its team pay close attention to what you eat. You get a menu that is healthy on account of having a nutritionist on staff. You also get local produce used in your meal and organic ones at that, even down to the coffee. I find that such care in your meal is well worth the trip. 3) Birks Café: ooh la la is all I have to say. This place is fancy, the food is impressive, refined and delicate and you get free refills on your mimosas. This is a great place for a special event where you will be given superior service. 2) Grange, with its tapas style menu, is a truly unique experience. 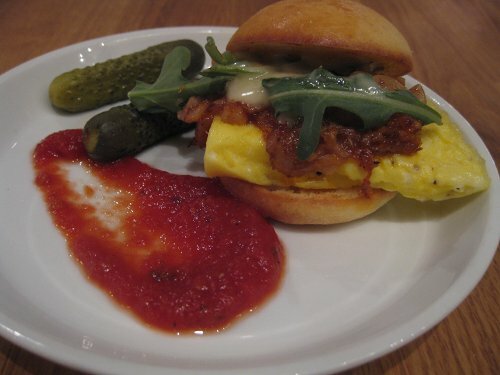 Their McGrange breakfast mini burger is precooked hours in advance and their dishes are fun for a group where you can almost sample everything on the menu and share it. 1) Chien Fumant has nothing run-of-the-mill here. They have theme brunches every once and a while which means you can come in one day and get a Dim Sum brunch, another day you can get a Brazilian inspired brunch and a Spanish brunch another time. This,as well that it’s “Canadian”, brunch is tasty, fun and uses ingredients for brunch you would not find in other places. While the place may be tiny, the atmosphere is fun. The Montrealais (Queen E) is a nice all-you-can-eat breakfast buffet where the service is excellent, the refills are plentiful and you definitely have some tasty options. Chateau Vaudreuil is back from last year since it offers you loads of food, good service and a nice ambiance. Lastly is Birks Café which although is multiple courses for a fixed price, you do not get seconds on food but you get constant refills on mimosas and there are enough courses to fill you up.